What's the connection between a plate of king prawns at your local restaurant and murdered fishermen in Honduras, impoverished women in Ecuador, and disastrous hurricanes along America's Gulf coast? Mangroves. Many people have never heard of these salt-water forests, but for those who depend on their riches, mangroves are indispensable. They are natural storm barriers, home to innumerable exotic creatures - from crab-eating vipers to man-eating tigers - and provide food and livelihoods to millions of coastal dwellers. Now they are being destroyed to make way for shellfish farming and other coastal development. For those who stand in the way of these industries, the consequences can be deadly. 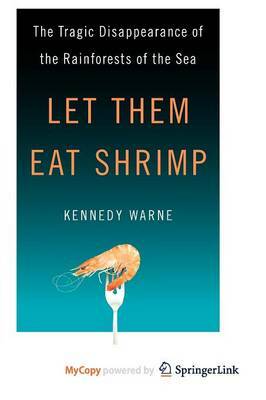 In "Let Them Eat Shrimp", Kennedy Warne takes readers into the muddy battle zone that is the mangrove forest. A tangle of snaking roots and twisted trunks, mangroves are often dismissed as foul wastelands. In fact, they are supermarkets of the sea, providing shellfish, honey, timber, and charcoal to coastal communities from New Zealand to South America to Florida. Generations have built their lives around mangroves and consider these swamps sacred. To shellfish farmers and land developers, mangroves simply represent a good investment. The tidal land on which they stand often has no title, so with a nod and wink from a compliant official, it can be turned from a public resource to a private possession. The forests are bulldozed; their traditional users dispossessed. The true price of shellfish farming and other coastal development has gone largely unheralded in the media. A longtime journalist, Warne now captures the insatiability of these industries and the magic of the mangroves. "Let Them Eat Shrimp lays bare the hidden consequences of everyday consumption, showing how Americans' eating habits are changing lives around the globe. Warne's narrative has staying power, but the worlds he captures are disappearing in the blink of an eye." --Wade Davis, author of "The Serpent and the Rainbow" and "One River"
"Kennedy Warne tells it straight: mangroves are under threat. In his passionate travelogue, he covers everything from vandal monkeys to life on the shores of the Red Sea, chronicling the global fight to save the rainforests of the sea. Let Them Eat Shrimp is a cocktail worth savoring." --Raj Patel, author of "The Value of Nothing"
"Kennedy Warne's effort to 'set the record straight' with respect to mangroves comes at a critical time and at an appropriate level to catch the attention of stakeholders, land use planners, and policy makers around the world."